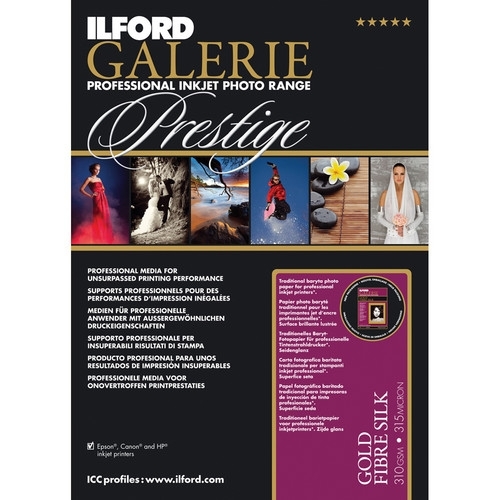 This 10-sheet pack of 8.5 x 11" Galerie Prestige Gold Fibre Silk from Ilford features a wide color gamut and a baryta (barium sulphate) layer with a fiber base. 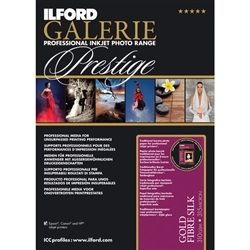 The paper is designed for pigment and dye-based ink systems and imitates the look of traditional silver halide photo paper. The paper's 310 g/m2 weight provides a heavy, professional quality medium. The nanoporous instant dry surface provides maximum ink absorption and allows for worry-free paper handling right out of the printer. The paper can be used for both black and white and color prints and provides the ability to imitate chemically toned sepia, gold, selenium & blue images.